Just look at this elegant backdrop, Adorn with rides and gold sequins backdrop. This Hanna is going to look gorgeous with the lights and the tea lights that are hanging from the ceiling along with the red beautiful flowers that catch your eye as they hang from the ceiling. If you’re Venue does not allow Candles this is the best way to use the lights that may be allowed from your venue. Keep in mind the ceiling here is quite heavy due to a variety of red flowers. 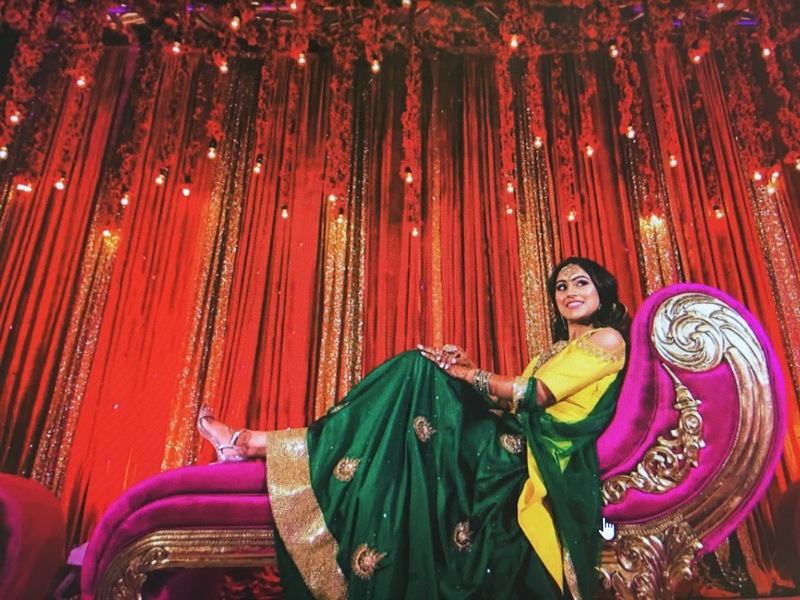 As you can tell the bride is wearing green and yellow but that’s OK we don’t have to use those colors in the back Trop as you can see here the backdrop is mostly rides. The hot pink so far along with the hot pink up lighting just complete the whole look make it look amazing without any additional Decour items that are needed. Don’t forget about the floor as it takes a big part of the photo we recommend covering the floor and ivory or white therefore it will not distract from the amazing backdrop that you have in the back. All of this is available with our company give us a call today.